As promised in my last review, I finally got around to reviewing another game from the "Humble Narrative Bundle": 80 Days (so that's three games out of the bundle, three to go - if you count Sorcery! Parts 1 and 2 as one game). I also mentioned in my last review the reason I bought the bundle and that's simply because I'm into games with strong narratives which usually means visual novels, RPGs and point 'n' click adventures. 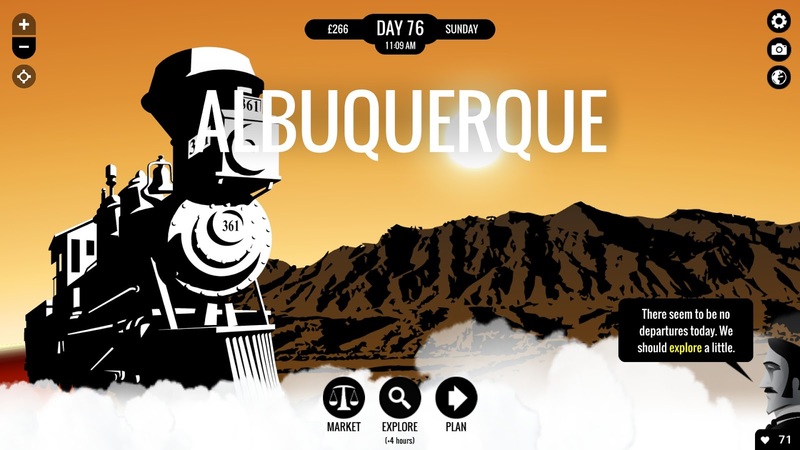 80 Days happens to be one that particularly attracted me because I've read the book "Around the World in Eighty Days" by Jules Verne so I wanted to see if the game did the book justice. I have to say that even though the game does an alternate history/steampunk take on the classic novel, it more or less stays true to the spirit of the adventure described in the book as well as its characters. The game plays like a typical visual novel except mixed with a game like Banner Saga or The Oregon Trail; just like those games, you're going from point A to point B and you'll stumble upon a lot of random encounters and quests along the way. Just like the source material, you take on the role of Passepartout assisting Phileas Fogg in a wager he makes with his social club: he wagers that it's possible for a man (using 19th century means of travel) to travel around the world in 80 days. While the game takes place in a steampunk version of the 19th century, it's still not an easy undertaking. Your job is to find the quickest way around the world while ensuring that your funds aren't depleted (since this means lengthy delays as you wait for money to be transferred from the bank). Sometimes finding the quickest route actually involves talking to the locals or exploring the towns that you visit along the way - so it's not simply a matter of picking the first route you find and going full steam ahead, sometimes you've got to do a bit of homework. Most importantly, as the manservant of a distinguished Englishman, you have to ensure that Phileas Fogg is comfortable on his trek across the globe. There are lots of painful choices that you'll have to make in order to progress through this game and I love games with choice (we're not called "Choicest Games" for nothing, mate). Do you decide to hang around and spend some time exploring each town or do you just take the first route you find? Do you take the most comfortable route which might take longer or be more costly, or the quick and dirty one? Do you take a detour just so you can sell a few items or not? It's all up to you and changes your story as a result. I also happen to be a person that loves world geography and there's no shortage of towns to visit here all with their own colourful descriptions (there's even AAAAAAAAAAAALBUQUERQUE). It's fun visiting 19th century steampunk versions of actual cities you've visited in real life and seeing how they've been re-imagined. The game is full of steampunk technology which seems to fit the story perfectly (especially considering Jules Verne is sometimes known as the grandfather of science fiction). There's a whole bunch of weird and wonderful ways you'll get to travel besides traditional means such as a steamship. You can see what routes other players have taken whenever you play the game which I think is a neat feature. It gives you the urge to play the game again and perhaps try the routes they've taken to see how it changes the story. Ultimately, once you've completed the game, you can share your itinerary with the world by auto-generating a webpage which you can share or bookmark. I've always said that visual novels or choose-your-own-adventure style games really need achievements. Thankfully, 80 Days comes with not only Steam achievements but Steam Trading Cards too. One playthrough takes about 2 hours to complete, so the game is quite short. However, there are so many routes to take that you'll probably want to play the game again, at least once (which is what I did). I’ve now learned to not get impatient and click on the loading screen lest I want to incur the wrath of the CTD. If you wait for a minute for the game to do its thing, all is good. If you don't, be prepared for CTDs. If you enjoy visual novels (which is basically the market this game is catering for) or just reading in general, you'll be fine. But for those gamers that want less reading and more action, this one is not for you. Not that I mind a bit of reading - I do play games like WORLD END ECONOMiCA after all... and that's a kinetic novel! It’s a visual novel mixed with role-playing mixed with Rogue-like meaning each trip will be quite different from the next. It's also all set in a Steampunk re-imagining of Jules Verne’s Around the World in Eighty Days (meaning even avid fans of the original novel will have something new to experience here). Is the game worth $9.99 USD? : No. While the writing is top notch, the setting is Steampunk (one of my favourite genres) and there’s obvious replay value here in trying to explore every nook and cranny of the world, ultimately this is a mobile game that would normally cost $4.99 USD on Google Play; $9.99 USD is $13 AUD with the current exchange rate. If the game were a few dollars cheaper though, I’d say go for it. Good review but you're not considering the replayability of the game. The script is of about 500,000 words and so you're going have to go through dozens of playthroughs before you even see a good part of it so I'd say its worth the price. The developers have made another fantastic series called Sorcery! and it's just as good with lots of choices and consequences , fantastic artwork and a great soundtrack. Cheers for the comment. It's true, I suspect this game does have a huge script considering how many locations you can visit and the fact that you can choose different outcomes at each of these locations. Ultimately it's a Choose Your Own Adventure style of game though so it really depends if you're into that kind of game or not, and if you are, you'll get your money's worth; if not, you might enjoy it for a couple of playthroughs and then drop it. I think this game is better suited to its original medium (i.e. as a mobile game) where it also happens to be cheaper :). I actually do have Sorcery! sitting in my Steam library so I'm looking forward to giving that a go in the near future :).